Events | Happy nom nom nom-ing! I am sad to announce that I have lost all my photos from both Taste of Sydney days. My memory stick for my camera has become corrupt so I must go out and buy another one. It is a bummer but I will still write about the food I tried at the Taste of Sydney. Sometimes I just hate technology. Although I was slightly disappointed by Taste of Sydney last year, I shall be attending this year’s event not once but twice. My disappointment from last year’s event mainly stemmed from the bad weather and having to trudge through the damp and muddy grounds. Also, my expectation was that it would be like the Good Food and Wine Show. However I am willing to give Taste of Sydney another chance and will be attending this year’s event. Taste of Sydney actually starts tomorrow Thursday 10 March and runs until Sunday 13 March. There are a range of sessions available, but I assume their busiest days will be Saturday and Sunday. I like the idea of how restaurants are able to provide a sample (at a price) of some of their signature dishes at a much lower price than what would be expected at their restaurants. It not only gives the restaurants and chefs an opportunity to promote themselves, but give people a taste of what they have to offer. The samples of food range from $8-$12, which are purchased using ‘crowns’. ‘Crowns’ are used as currency in Taste of Sydney to avoid the unhygienic fumbling of cash whilst trying to serve food. Although this way they can guarantee the sale of ‘crowns’ even if they are not all used as you can only purchase them in books of 30 crowns. There are also many demonstrations, Q & A sessions, cocktail making classes and coffee appreciation sessions. Also, if you’re a HSBC customer, HSBC has designed a premium VIP Lounge on-site at Taste of Sydney exclusively for HSBC Customers. Simply make your way to the HSBC VIP Lounge, show your HSBC Card at the HSBC Customer Entry and you and a friend can enjoy a complimentary beverage and a comfortable seating environment with live entertainment. I know where I’ll be when I get tired. If you do plan on going I suggest you pre-purchase tickets as they are slightly cheaper than buying them at the door. I will be attending this Friday’s noon-4pm session and this Saturday’s 5:30pm-9:30pm session. Hopefully I’ll see some of you guys there. If you want to see the menus on offer, the restaurants participating or just more information, click here. I hope everyone had a great New Years Eve! I had a great night with the boyfriend and my friends. Many of my friends are overseas but I’m sure they had heaps of fun as well. The night was filled with heaps of food and drinks. The night was very fun. We watched the 9pm fireworks on tv, then we headed out to the nearby golf course to watch the fireworks. We couldn’t see the bring but we could see 5 sets of fireworks all across Sydney. My friends and I spent most of the night talking and in the spa relaxing. I hope everyone else had a great new years eve. I hope 2011 is as good a year as 2010 was, filled with good food and great friends. Whenever people ask me who my favourite celebrity chef is, my answer is always Heston Blumenthal. He is my idol. Ever since I learnt about him, my dream is to visit his restaurants in the United Kingdom. When I heard that he was coming to Australia, I nearly had a heart attack. I had to go. I can officially say that I will be attending his only Australian show. I wish I got better tickets, but these aren’t too shabby. I’m so excited to see what he has to say. I guess it’s kind of scary to be able to see you idol in person, rather than see them through a screen. I’m sure he will not personally talk to me, but just to have the chance to see him in person is enough. Oh I’m so silly, I’m tearing up as I think about it. I’ve never really admired any real celebrity until now, but I think he’s just fab (I’m getting into my ‘English’ lingo). 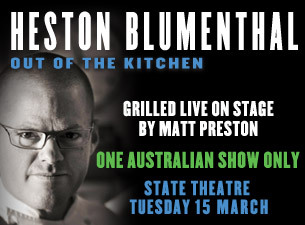 If any of you are interested in going, you can buy your tickets through Ticketmaster or alternatively just Google “Heston Blumenthal – Out of the Kitchen, Live – Grilled by Matt Preston”. I saw that Showbiz was selling tickets as well, but their seats are not as good and are more expensive. Bring surrounded by loads of stalls ranging from chocolate truffles, to gelato, to olive oil and ginger beer, I had heaps of fun sampling foods from many different stalls and most of the time I would end up purchasing something. How can you say no to deliciousness. My granny trolley which I had brought along came in handy with helping the boyfriend, his sister and my best friend tow around all our goodies. Best investment ever! It may not be that stylish, but it saves you from lugging around your purchases. Seeing Gary Mehigan, George Calombaris, Matt Preston, Adam Liaw, Marion Grasby and Donna Hay! Matt Preston has lost a lot of weight. Well done! Sitting next to Adriano Zumbo while he demonstrated how to pipe. He was like 30cm away from me! *swoon* I got a photo with him as well. He’s so nice and down to earth. Bumping into Lorraine (Not Quite Nigella). I saw her from afar but was initially too shy to say hello, it took some discussion with the boyfriend, his sister and my best friend to see whether or not I had seen the wrong person to finally convince myself to go and say hi. To say I was like a giddy little school girl is to say the least. Side note: Lorraine, I’m sorry if I seemed weird in any way at all. I had so much fun today. I’m always so happy when surrounded by food. Even though it was hot and muggy, the food made up for it. Normally I would’ve been complaining about the weather, but the food just makes up for it all. MasterChef Live is on until this Sunday, if you have a chance to go you should. So what is everyone doing on Friday? I know where I’ll be..at MasterChef Live 2010. I’ve just received information that MasterChef Live is giving away free promotional tickets for Friday 10th December. So if you want to go for FREE, print and complete the form and present on arrival. It’s as simple as that. Although you don’t get a seat in the MasterChef Live Theatre Show or the Jaguar VIP Lounge, there are a stackload of demonstrations and other foodie things to see. MasterChef LIVE Australia is coming to Sydney in December. Over 3 days there will be live theatre shows, cooking demonstrations, heaps of stalls and a stack of celebrity chefs. Currently, taste.com.au have an offer on. 2 for 1 tickets to MasterChef LIVE! This offer is available for Gold and Silver tickets for the Friday and Sunday. So that’s $70 for 2 Gold tickets, how cheap is that? There are many sessions per day that you can choose from. This offer ends next week, so if you were planning to go then buy your tickets soon. I just bought 4 tickets and I got pretty good seating. I assume this will be like the Good Food and Wine show but better. I’m excited to be going. I hope to bag heaps of goodies!